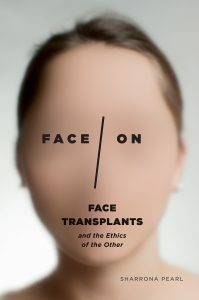 At New Books Network, you’ll find a podcast interview with Sharrona Pearl, author of one of our best-covered (as in images) books of late, Face/On: Face Transplants and the Ethics of the Other, a perfect storm of cultural studies and synthetic and biogenetic technologies. A brief description from their post follows below, but here’s the real link: to listen in to the fascinating hour-long talk with Pearl! *** Troubling the indexical relationship between the face and character and reminding us that “he self has always been a set of choices,” Pearl explores face transplantation as it relates to cosmetic surgery and whole-organ transplants, the cinema of the 1960s, television shows, and more. She carefully and sensitively takes us into the debates among surgeons, bioethicists, and journalists that circled the first partial face transplant of Isabelle Dinoire in 2005, and offers a way toward a philosophical approach that brings together Levinas with the kind of (Deleuzian) subjectivity that allows for individuality through constant change and understands the self to be constantly in a process of becoming. 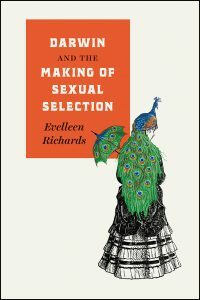 The final chapter of the book also situates the analysis within larger contexts of online subjectivities and work with facial and bodily manipulation by artists and performers. . . .
Elle Hunt at the Guardian takes on Evelleen Richards’s expansive account of Darwin’s theory of sexual selection, perhaps the biologist’s most misunderstood and least explored supposition: Richards argues that, more than natural selection, Darwin’s theory of sexual selection was uniquely his own and, perhaps as a result, often misunderstood. His theorizing drew upon a wide range of influences, many of them deeply personal, including his grandfather Erasmus’s radical writings on evolution and his own relationship with his wife. In, On Darwin and the Making of Sexual Selection, published last month by the University of Chicago Press, Richards explores this confluence of connections Darwin had to make and, just as crucially, the challenges he had to overcome in order to reach his conclusion. Given the conventional understandings of beauty, gender and sexuality of the Victorian era, it is difficult to overstate how radical Darwin’s theory was at the time. It was the culmination of a lifetime of intellectual legwork – and yet he was constantly called upon to validate it until his death in April 1882. “The accepted point of view was that all the beauty that we experience on Earth was created by God for his own and human delight,” says Richards. . . .
From “Fungi to be with,” a recent joint review of Ed Yong’s I Contain Multitudes and Patrick Forterre’s Microbes from Hell in the TLS: Yong takes his readers to the forefront of microbial science by interviewing the relevant researchers, one of whom could have been Patrick Forterrre of the Institut Pasteur. 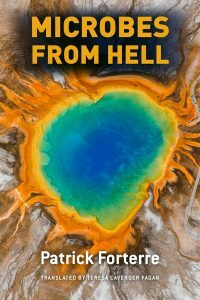 The fact that Yong didn’t make it to Paris makes Forterre’s memoir, Microbes from Hell, read as a clean take on some of the same material, in particular the micro-organisms that have adapted to live in extreme environments. These “extremophiles” can cope with the high temperatures of hot springs and deep sea thermal vents, which are often also highly acidic or abound with sulphur. Others thrive in intensely salty places, or with amounts of radiation that were long thought to be inimical to life. Their adaptations and coexistence with their own viruses have much to tell us about life on earth and its history. 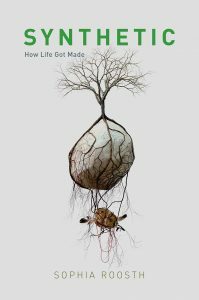 To read more about Microbes from Hell, click here. . . .
Don’t miss this clip from a glowing review in the latest Science for Sophia Roosth’s Synthetic: How Life Got Made. *** It is at times hard to distill that which unites the people and projects that travel under the name ‘synthetic biology,’” Sophia Roosth notes in this new ethnography, but that doesn’t stop her from following the field in flux, tracking “brave new organisms” (and those who make them) through classrooms and industrial laboratories from Boston to the Bay Area and from neighborhood bars to far-flung conferences. A chimera of anthropology bred with a dash of history, Synthetic reads synthetic biology’s constructs both as “materialized theories” and as “postcards from a particular cultural moment.” Navigating the shimmering categories of the natural, unnatural, supernatural, and postnatural, Roosth plays with traditional ethnographic conventions of the anthropologists’ toolkit—religion, kinship, economy and property, labor, household, and origin tales—to show how “the form and function of life-forms have … oftentimes paralleled social, historical, and political forms of life.” . . . “There is no there there,” Roosth ultimately concludes, channeling Gertrude Stein’s method of wreaking worlds with words. “What counts as ‘real’ or ‘original’ no longer makes any genetic, genealogical, ontological, or historical sense.” But at this point . . .
From a recent review of Jessica Riskin’s The Restless Clock: A History of the Centuries-Long Argument over What Makes Living Things Tick, by George Scialabba at Inference: According to the delightful science fiction romance film, Her, artificial intelligences also socialize, or will before long. I imagine them asking one another at parties, “Are you an agent?” They will not, of course, be asking about literary representation, but about the psychological or emotional or moral capacity we commonly call agency. They’ll be looking to find out whether the AI they’re meeting answers ultimately to itself or to someone else, whether it can set and change its own goals, whether it can surprise itself and others. Beings possessed of agency are autonomous, spontaneous, capable of initiative, and moved by internal as well as external forces or drives. According to Jessica Riskin’s The Restless Clock, agency is everywhere, or at least far more widespread than is dreamt of in modern philosophy of science. If agency is “an intrinsic capacity to act in the world,” then science is not having any of it. It is “a founding principle of modern science … that a scientific explanation must not attribute will or agency to natural phenomena.” This ban on agency is . . . Though it’s behind a paywall, here’s a teaser from a recent review by Steven Shapin of Jessica Riskin’s The Restless Clock: A History of the Centuries-Long Argument over What Makes Living Things Tick, at the LRB. *** When you consider the difference between a human being and a machine, you start with some idea about what it is to be a human being and what it is to be a machine. Some people now celebrate the technological advances that can make it hard to tell the difference; others view that difficulty with anxiety. They are concerned when machines do what we want to do; and they have species-self-doubt when machines do things that once defined what it was to be uniquely human. The worst worry is that the machines will refuse our orders, that they may acquire a will of their own, and want free agency. You start out with some matter-of-fact presumptions about what each sort of entity really is. If you’re reading this piece, you’re almost certainly a person, and you assume that its other readers are too. you might be reading it on a machine, just as I wrote it on a machine, and it was typeset on a machine. I didn’t have . . . 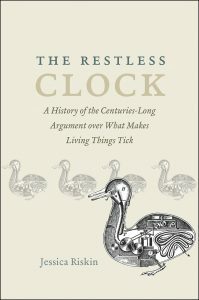 The TLS recently reviewed Jessica Riskin’s The Restless Clock: A History of the Centuries-Long Argument over What Makes Living Things Tick, and though the full review is behind a paywall, its closing moments help to elucidate Riskin’s contribution to how we make sense of reasoning (no pun intended), from both a human and non-human perspective: But Riskin also uses history as a way of thinking about the world, not just as a way of getting facts about the past right. “Historical understanding is integral to scientific understanding,” she claims, as she explores discussions among biologists and philosophers about directed mutation, drawing on work by Lamarck, Darwin, August Weismann and Richard Dawkins. This concern—the lack of humanistic and historical thinking in scientists’ and philosophers’ work—bookends her study. Jessica Riskin shows us the many ways in which scholars have sought to understand those parts of the world that are material, movable and predictable, and those that are characterized by agency, passions, chance, suffering and consciousness, as well as the tricky areas where they overlap. She mobilizes powerful examples from the history of the life sciences of where and how attempts at explaining these areas have succeeded and failed. Her journey takes us everywhere in the . . .
“William Harvey’s Restless Clock”* Against this passivity, however, there were those who struggled to hold matter, feeling, and will together: to keep the machinery not just alive but active, life-like. These holdouts accordingly had something very different in mind when they talked about the “animal-machine.” William Harvey, whom we have already seen comparing the heart to a pump or other kind of hydraulic machinery, also invoked automata to describe the process of animal generation. Observing the development of a chick embryo, Harvey noted that a great many things happened in a certain order “in the same way as we see one wheel moving another in automata,and other pieces of mechanism.” But, Harvey wrote, adopting Aristotle’s view, the parts of the mechanism were not moving in the sense of “changing their places,” pushing on another like the gears of a clock set in motion by the clockmaker winding the spring. Rather, the parts were remaining in place, but transforming in qualities, “in hardness, softness, colour, &ce.” It was a mechanism made of changing parts. This was an idea to which Harvey returned regularly. Animals, he surmised, were like automata whose parts were perpetually transforming: expanding and contracting in response to heat and cold, . . . Though perhaps best known in the United States for his fiction, Bengali writer Amitav Ghosh has previously published several acclaimed works of non-fiction. 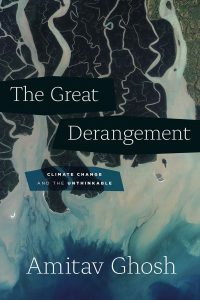 His latest book The Great Derangement: Climate Change and the Unthinkable tackles an inescapably global theme: the violent wrath global warming will inflict on our civilization and generations to come, and the duty of fiction—as the cultural form most capable of imagining alternative futures and insisting another world is possible—to take action. From a recent starred review in Publishers Weekly: In his first work of long-form nonfiction in over 20 years, celebrated novelist Ghosh (Flood of Fire) addresses “perhaps the most important question ever to confront culture”: how can writers, scholars, and policy makers combat the collective inability to grasp the dangers of today’s climate crisis? Ghosh’s choice of genre is hardly incidental; among the chief sources of the “imaginative and cultural failure that lies at the heart of the climate crisis,” he argues, is the resistance of modern linguistic and narrative traditions—particularly the 20th-century novel—to events so cataclysmic and heretofore improbable that they exceed the purview of serious literary fiction. Ghosh ascribes this “Great Derangement” not only to modernity’s emphasis on this “calculus of probability” but also to notions of . . .